Applied Residential provides a suite of highly flexible, lease-based home financing programs under the brand name Trio®, designed to create high rates of adoption with consumers and impressive rates of return for investors. The Trio® residential leasing program is patterned after the market-proven automobile leasing model. It is designed to provide flexible home financing and extend the availability of credit to the housing market. For first-time homebuyers and those impacted by the new regulatory environment resulting from the great recession, mortgage financing continues to be a challenge. Applied Residential's public-private partnerships are designed to provide greater access to homeownership, enhancing the benefits of Trio® Own Option™ leasing. Beginning on the West Coast, the California Affordable Housing Agency (CalAHA) partnered with Applied Residential to deliver much needed home financing for hard-hit communities. Through structured financings, including municipal bond issuances and Applied Residential's Lease Backed Assumable Mortgage®, Trio® delivers a much needed mortgage alternative facilitating homeownership recovery. Known as "TrioNext", Applied Residential's home re-financing program helps families keep their homes when they do not qualify for refinancing or modification options. Designed with the input of leading housing experts, TrioNext® coordinates a structured short sale program with participating lenders and servicers that increases consumer pull-through rates, preserves credit impacts, and enhances liquidity for troubled mortgages. 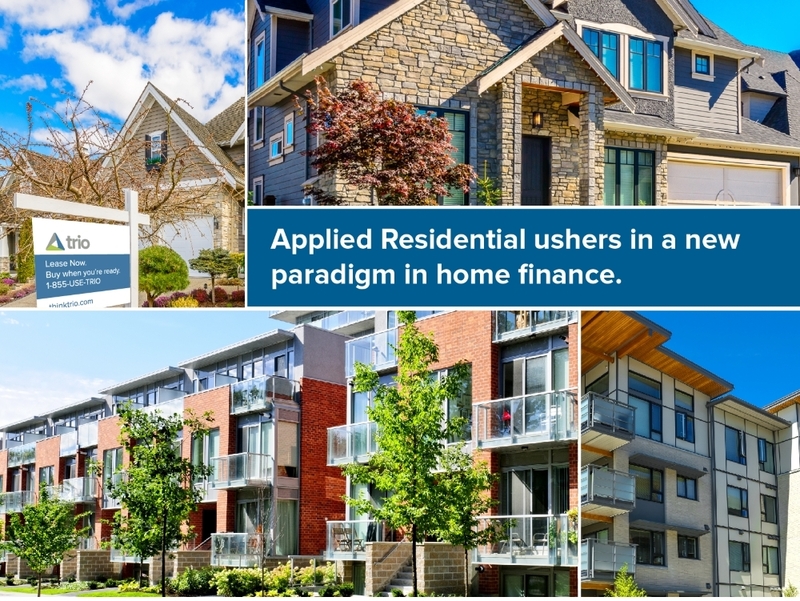 Applied Residential understands that the strength of the housing market is directly linked to affordable and responsible financing. Applied Residential's Lease Backed Assumable Mortgage (LBAM®) is a new origination product targeted at nearly qualified consumers needing time to season their financial situation to meet today's underwriting criteria. originated to an institutional borrower that contains a one-time assumption feature under consumer based rates and terms. LBAM® combined with a Trio® Own Option™ lease delivers new originations and bridges consumers into responsible homeownership today. Applied Residential markets LBAM to consumers under the brand name Own Option™ Mortgage. Applied Residential and its holding companies is partnered Canadian based Fourwall Partners under the name TrioGroup. TrioGroup is a multi-disciplined asset management group delivering investment alternatives to institutional and retail investors in the United States (through Trio Opportunity Fund) and in Canada (through Trio US Opportunity Fund) with a focus on asset-backed yield. TrioGroup exclusively offers investment opportunities supporting Trio's proprietary residential lease financing program and in the mortgage securities generated from Trio through its partnership with New York based Brean Capital. TrioGroup's investment strategy is intended to deliver returns that exceed market averages while minimizing the risks and costs associated with typical residential investment products. TrioGroup features investments in equities of newly built single family homes and residential mortgage securities used to finance these homes. With over 14 years of experience in residential lease financing, a seasoned cross-border asset management team and strategic relationships with several of the USA's largest homebuilders, TrioGroup is well-positioned to expand its investment offerings to new investors and asset managers seeking superior income producing asset-backed returns. Trio is a registered service mark of Applied Residential, Inc. All rights reserved. ©2017 Applied Intellectual, LLC.